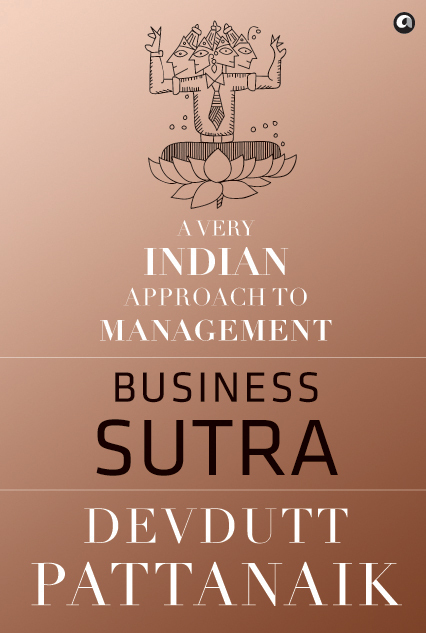 In this landmark book, best-selling author, leadership coach and mythologist Devdutt Pattanaik shows how, despite its veneer of objectivity, modern management is rooted in Western beliefs and obsessed with accomplishing rigid objectives and increasing shareholder value. By contrast, the Indian way of doing business – as apparent in Indian mythology, but no longer seen in practice – accommodates subjectivity and diversity, and offers an inclusive, more empathetic way of achieving success. Great value is placed on darshan, that is, on how we see the world and our relationship with Lakshmi, the goddess of wealth. Business Sutra uses stories, symbols and rituals drawn from Hindu, Jain and Buddhist mythology to understand a wide variety of business situations that range from running a successful tea stall to nurturing talent in a large multinational corporation. At the heart of the book is a compelling premise: if we believe that wealth needs to be chased, the workplace becomes a rana-bhoomi – a battleground of investors, regulators, employers, employees, vendors, competitors and customers; if we believe that wealth needs to be attracted, the workplace becomes a ranga-bhoomi – a playground where everyone is happy. Brilliantly argued, original and thoroughly accessible, Business Sutra presents a radical and nuanced approach to management, business and leadership in a diverse, fast-changing and increasingly polarized world.